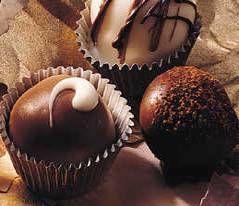 These truffles are as good as any you can buy! Purchase pretty paper candy cups from a candy supply store, place the truffles in the the cups; gift wrap, and you have a lovely Easter or Passover gift to give. 1. Cover cookie sheet with aluminum foil. Melt baking chocolate in heavy 2-quart saucepan over low heat, stirring constantly; remove from heat. Stir in butter until melted; stir in whipping cream. Refrigerate 10 to 15 minutes, stirring frequently, just until thick enough to hold a shape. 2. Drop mixture by teaspoonfuls onto cookie sheet. Shape into balls. (If mixture is too sticky, refrigerate until firm enough to shape.) Freeze 30 minutes. 3. Heat shortening and chocolate chips over low heat, stirring constantly, until chocolate is melted and mixture is smooth; remove from heat. Dip truffles, one at a time, into chocolate. Place on aluminum foil-covered cookie sheet. Immediately sprinkle some of the truffles with finely chopped nuts or decorating candies. 4. Refrigerate truffles about 10 minutes or until coating is set. Drizzle some of the truffles with mixture of 1/4 cup powdered sugar and 1/2 teaspoon milk. Refrigerate just until set. Serve at room temperature. Store in airtight container. The shortening helps set the chocolate coating so it doesn't melt as easily.